Old Wood Windows – Repair Or Replace? After I said on my Facebook page about a year ago how sad it is that people get rid of old wood windows and replace them with new (mostly vinyl) windows, here I am contemplating the very same thing. Actually, I’m pretty well beyond contemplation. I’m in the planning and shopping stage. Even though I won’t be able to afford them anytime soon (an HVAC system is far more important to me), I’ve been shopping around, comparing brands, etc. But I will admit that every time I get online and start shopping around for windows, I feel a little bit of guilt at the thought of getting rid of all of my old wood windows. But here are the factors that lead me to the decision to replace. First of all, the thought of having to repair every single wood window in my house is more than just a little bit overwhelming. I would have to repair every window in evey room except the sunroom, which is filled with aluminum windows. None of my wood windows work properly, and I have a feeling it’s because they’re all covered with layers upon layers of paint. I’d bet money that at least one of those layers is lead-based paint. Do you spot the seafoam green? That color has been on every single thing — interior walls, interior doors, trim, exterior siding. Everything at one time was painted seafoam green! But all of those layers of paint are keeping all of my windows from working properly. Most of the windows won’t even budge, but the ones that will budge will only move slightly. And you can see that someone in the past, instead of reglazing the windows as they needed it, decided to do a little repair with caulk instead. 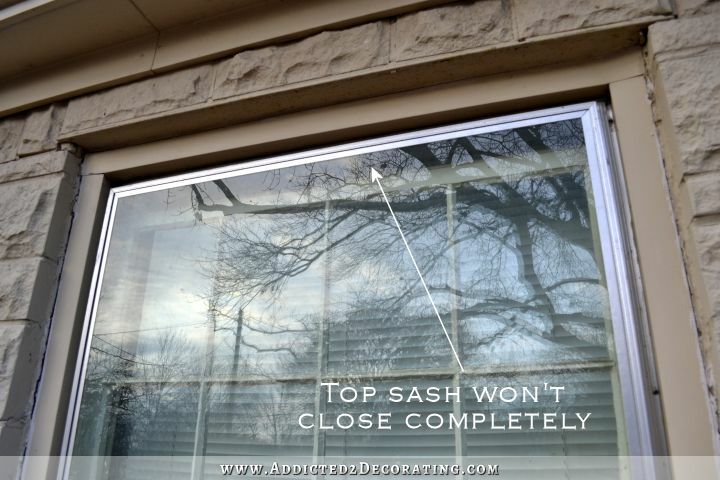 Wood windows should be glazed, not caulked!! Some of the windows won’t close all the way. This is the front window in Matt’s game room, and you can see that there’s about a 2-inch gap between the top sash and the top frame. Thank goodness we have storm windows! So there’s literally not even one single wood window in my house that wouldn’t need to be removed, stripped down completely, reglazed, reprimed, repainted, and reinstalled. And it appears that some of them will need even more work than that to get them working properly again. Another thing about old wood windows is that in order for them to be energy efficient, you absolutely have to use storm windows on them. Well, I have storm windows, but they’re ugly aluminum windows. Not exactly the look I like. So in addition to all of the work that it would take to get the windows functional and looking pretty again, I’d also want to get all new wood storm windows. And those things are pricey!! Especially if I got the kind that I really want with the interchangeable glass/screen panels. There’s also the issue of matching these windows. Two of the old windows are gone, and have been replaced with aluminum windows. I have no idea how I’d go about replacing those. I’ve been told that you can find old wood windows at ReStore, but I’ve never found any like mine. So would they have to be custom made? I can’t even imagine how much that would cost! 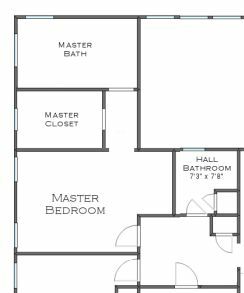 And then what would happen when we do our major remodel in the back, adding a master bedroom, laundry room, and family room? Would all of those have to be custom made as well? *Sigh* It just seems like way too much. But the final straw for me came just the other day when I was researching how to repair old wood windows, and I came upon one restoration site that said post-WWII wood windows aren’t even worth saving! I couldn’t find the site this morning (I wanted to share it with you), but it was a site that was all about saving historic homes, and so of course, it addressed old wood windows, and the importance of saving them. And yet it said that post WWII wood windows aren’t worth it. Evidently after the war, wood windows were made very differently from the way they were made at the turn of the century. The historic wood windows were hand crafted of dense, hard wood, and were put together using rope and weights. After the war, things changed. They were made of cheaper materials and were being made much faster (no longer by talented craftsmen). They also did away with the rope and weight system. And finally, instead of building the window as two separate sashes that can easily be removed individually for repair, the windows were built as one piece set in a frame that had to be installed together. And sure enough, my post WWII wood windows don’t have ropes and weights. They have some sort of spring system instead. And the sashes won’t come out separately. They’re set in a frame that has to be taken out as a whole unit. To be honest, I was glad to come across that information, and to realize that my old wood windows aren’t the highly coveted historic wood windows. (Highly coveted by historic home restoration enthusiasts, that is.) That knowledge kind of let me off the hook as far as feeling obligated to repair and keep these windows. And yet, I still feel a twinge of guilt at the thought of getting rid of them. What would you do? Would you still repair and keep them, simply because they’re old wood windows? Or would you replace them with something new, and not feel a bit of guilt at doing it? 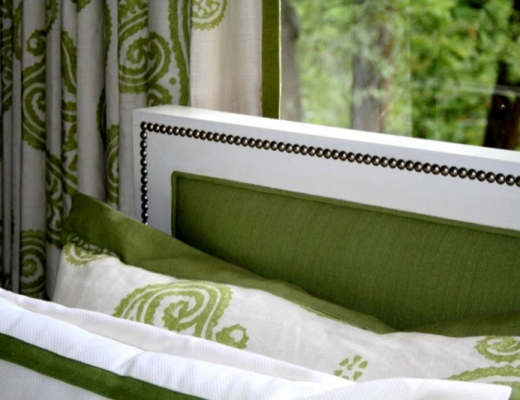 Previous Post DIY Wood Framed Upholstered Headboard With Nailhead Trim - Finished & Installed! This may not be a popular answer — but get new windows. You don’t need anything super fancy or made of a lot of vinyl, you can find windows that are wood on the inside and aluminum on the outside. Even wood all the way around. By replacing you can also add (probably needed) insulation around the window, and ensure there are no leaks anywhere on the wall. You will also be able to choose windows you want — any style or size, with no storm windows to worry about and new screens. I agree! Replace them. Donate your old ones and let someone who’s looking to refinish them have at it. No waste and you won’t be obligated to do that much work when your heart isn’t in it. In the name of energy efficiency (yours) replace them! I would replace. Knowing the age of your home, I didn’t think they would be worth saving. Get new. They are energy efficient. No guilt at all! You’re the one that has to live with the drafty old windows, and I’m with you-they’re not the “good” old windows. Sometimes old is just that… old. You could always repurpose them for something cool like you did with your doors too! I’ve used old windows to hang above my mantle, and as fun “artwork” for my outdoor patio. Good luck! I’m with the “replace them” crowd. The old ones are decrepit, inefficient and frankly not worth the work. You’re not going to be able to make them as energy efficient as new vinyl windows no matter what you do – and stripping them would be a nightmare. It would be foolish to undermine your new HVAC system when you get it with crappy inefficient windows. I saved old ones when I had my new ones installed and my brother used some of them when he built me a new garden storage shed – the old ones were perfect for that purpose. I now have a big shed that isn’t like a dark cave when I go in to fetch/find things. The windows on three sides ensure that the interior is always bright – a big plus since I didn’t want to run wiring down to the end of my yard so I could have a light inside the shed. We live in a house built in 1916 with *39* 8 foot tall windows, and quite a few of them are in various states of rot, panes broken, and only a few of them still have working ropes/weights. As much as it pains us, we are going to replace – a few at a time, as we can afford it. We have to, because our heating/cooling bills are astronomical and if we were to sell the house, it would be a great upgrade to have on the books, probably more so than a newer kitchen/baths. If you are looking to restore to oringinal then, l would…if not, with the Windows not being of WWll grade,if it were me l would up grade. Another thing to consider, is the finished look you want, Windows included. Having done both options several times, I vote for the new windows if finances allow. They are more air-tight (and dust-tight), better insulated. They can be flipped open for cleaning. Unless you’re re-doing a house with historical value, I would always vote for new (and improved) windows. Twelve years ago when we moved into our house one of the things I loved was the two huge mullioned picture windows in the living room set in a corner. They were more than 6 feet by 4 feet and the squares created by the mullions were about 12 inches sq. They were beautiful and gave our house such a cottage feel. BUT- they didn’t open, they had storms the same size and the storms were in really poor condition with rot in a couple of the corners and they were VERY drafty. So we had the same quandary- should we pay who knows how much to restore the windows or get new? Well we ended up getting new. I loved the look of the old ones and in the end we just couldn’t afford something with the same look. But now we have a square in the center with smaller windows that open on either side and I really love them. We can catch the cross breeze on nice days in spring to fall and are now warm in the winter and in Michigan that is very important. All that is to say- get new windows, be warm/cool and don’t feel a second of guilt! Oh, I forgot to mention- our house was built in 1949 and those were original to the house. All but two of the regular windows in the house have been replaced before we moved in. Don’t feel guilty, do what is going to make you happy, and cozy and comfortable. My husband and I bought a house built in 1900. At some point, they added on to it creating a breakfast room and powder room. When it came time for the previous owner to sell, he replaced every window in the home with vinyl ones except for four, three in the breakfast room and one in our powder room. Those four windows are still wood ones, and I cannot wait to replace them. One, so I can properly heat and cool this room, and two so everything matches. Nicole Curtis be damned, because I cannot wait for vinyl. That’s a hard one. On one hand you want to maintain the period integrity of the windows and restore what you have. On the other- the reality of cost, time, and iffy energy efficiency. Having replaced the old aluminum windows in our old house with vinyl and dealing with the stuff in our new one- They are nice and efficient, but they do not have the interest that wood ones had (my parents have wooden windows). For the sake of energy efficiency- I would lean towards new. If they aren’t the historical quality.. and lack the ease of cleaning… I’d probably go with new. Do a few at a time… that’s what we did. In this case I don’t think period integrity is an issue. The house itself doesn’t have any intrinsic historical value, nor do the existing windows have any features that would render them particularly valuable. The interior is being extensively changed and upgraded. The windows should get the same treatment for the sake of comfort and pragmatism if nothing else. I’m 100% in agreement with you Carswell in both of your statements. Classic lib talk. 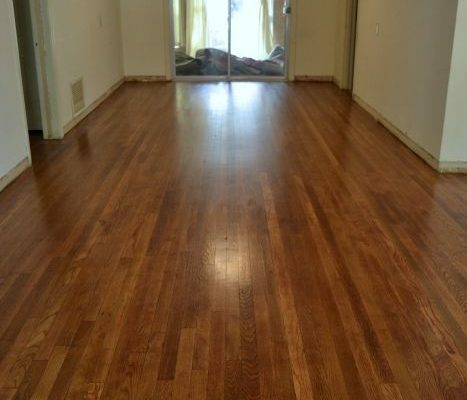 How about restoring a historic wood that cannot be matched in quality with today’s wood. The vinyl (plastic) energy efficient windows of today will warp, break or obsolete in 3-4 years and need replacement. Meaning that plastic window ends up in the dump, “destroying the environment”. i agree that the vinyl windows were a rripoff for (good my Dad is not here to see) I gave my Dad a money gift to get what he wanted for his self for retirement, he choice to get this Joe Frazier Window Wizsard windows which,he thought were going to be brand new!!! But until one day I came over during installation of the downstairs bathroom window they had wood all over the porch and yard to make him,(not me) believe he was getting new frames and all.Well long story short I showed him that the man was just cutting a strip off those long and short wood planks,outlinning the wood frame with them and then covering the wood with vinyl and air gun tacking it in place around the frame of the window ,Now 18 years latter this past summer, I’ve a kitten, now 5 yrs, and its main room is the bathroom downstairs window. My cat is a persian and this summer he is protected against flees and other cats he’ basically a house cat front porch and walk on leash to corner thats it. well one day i was bar-b-queing in the yard and my cat was in the window just going it ,somethin was in his fur but I just could not pin point the itching spot so I gave him another flee bath clean his room and the windo ceils with hope that I help solve his problem for we had a heat wave for a few days,Then Bomb he knocked down everything in the shelves and toilet tank to get at whatever was in his fur he tore the shade and lil drapes and low and behold in the window frame all along the felt of the window insulation and the window corners were these tinee tiny lil bugs like grapes on a grapevine all clustered together, if you didn’t stare at them you would of not noticed they were moving there all over one another along the felt of the window edge and going back and forth in and out of the corners of the windows were they did not put caulk and the hole were the siding meets and they don’t put and sealing. So your right the aluminum is just a cover up for windows and allows whatever the insects were (they weren’t termites Thank God) were able to annoy my animal and me when I couldn’t understand why something felt like it was crawling on me after i pet my cat , and i spent good money on a commercial pest killer to get rid of the unknown creapy cridders. So I rather try to redo my existing windows i do have one with a rope and wheel it doesn’t have a draft but,the rope popped and I just haven’t got my self settled yet to deal with it, But I love my old windows just have to keep up maintenence Good Luck to each his own ,put I don’t like unseen,unknown bugs you should of seen how many were draped and kept regrouping out even after spraying! I like to see my enemy these guy were living in between the wood &vinyl &the felt linning built in the window!! When we bought our drafty 1927 Dutch Colonial we quickly realized the inefficiency of leaky original wood windows. You can stay true to the design of your home by adding pane divisions etc. Our house is now much more energy efficient, especially on those winter days where it’s -40 degrees Celsius! Added bonus: keep the old windows and sell them on Kijiji… we sold all our old windows and made at least $600. People were reusing them for sheds, cabins or craft projects (check pinterest for ideas). A win-win situation as they didn’t end up in the dump! All in all we are very happy with our decision to replace our windows. Think about partnering with a window company. The blogger at “Migonis Home” did this. She got new windows for her house and wrote about the befores and afters on her blog. Get new ones. Sale the old ones to cut on the cost. South GA they are running around 15-25.00 for old windows. We have an old home and we did. So glad we did. Before I even got to the part where you said some research you read said post WWII windows aren’t worth saving, I was thinking to myself that your house isn’t really old enough for you to worry about saving the wood windows. I think saving them would be good for a really old house, early 1900s for example, but 1950s and on? Nah, I would replace them. It’s better to upgrade in that area in my opinion. Green house!!! Such an awesome idea!!! (assuming those things aren’t painted with poisonous dyes from ages ago)! Brilliant idea…..a greenhouse. Kristi, Is there a way to have a paint chip tested for lead? The local contractors association or EPA might could help with that. Maybe at no charge. If there’s no toxicity, then a greenhouse is such a terrific option to consider. That is….if you like greenhouses…. If not…maybe windows in an open air porch….Well done, Laura. And even if the old wood windows do have lead paint, you can take them to a professional paint stripper and have them stripped. The price on that should be rather reasonable in your area. Here in West Los Angeles, professional paint stripping costs an arm and a leg, and while they would remove the old lead-based paint from a small group of old shutters I wanted to use in a craft project, the cost was ridiculously prohibitive. You should be able to search blogland for inspiration for a small garden greenhouse using your old wood windows. It’d be a way to recycle them and reuse them for a useful backyard project if you are so inclined. I was finally able to afford to get rid of my old wood leaded glass windows ( I saved the 4 smaller ones and was able to sell them!) and I’ve never looked back. I was tired of ice building up on them in the winter, the wood was rotting and they leaked like crazy. Now my house looks so much better with the white vinyl windows, my house is warmer in winter, cooler in the summer, and I love the tilt in feature for very easy cleaning. The majority of mine are double hung but I have 4 smaller windows that are casements. I found a local company that makes them here (Columbus) and they are highly regarded. I was even able to make some changes like having the bathroom window (which is very close to my neighbor) done with frosted glass so I don’t have to have a blind or window treatment on it. I think what makes this so daunting is that it’s a big outlay of money all at once. Perhaps when you sell the condo you will have some discretionary money to put towards your windows. I would not hesitate. My son replaced all of his windows in a house built in the 1940s. They tested and found lead paint as was to be expected on any house of this age. There was an additional cost of $35 per window for lead paint but the windows look wonderful, they are safer as each time you open a window lead particles were released and so much more efficient. Go for it. This was the comment I was waiting for…the lead paint issue. Our first house was built in 1875 and each and every one of the 27 windows were finished in lead paint. Particles were released each time we opened and closed a window. It only took 2 months of living there until our 10 month old got sick from it. Thankfully, we caught it in time before his levels became high enough for permanent damage. We had no other option but to caulk and paint all the windows closed. I worry about this issue constantly when I see someone living and making renovations in an older house, like Kristi and Matt do. So, yes, feel no guilt whatsoever in replacing them…and please be cautious (mask, gloves, goggles) when working around lead paint! Better yet, hire out the removal of the windows to a company who is certified in working with dangerous substances. I just moved in to a 1941 house in November. I felt the same way about old windows as well. I have 13 of the rope and weight windows, none of which open. And some have been weather proofed using less than ideal methods. We also have 6 post WWII old double pane windows (one of which does open!) that the seals have been broken and are cloudy. After our first electric bill I think we have decided to replace. Eventually. $$$$. On a related note, we are replacing the original front door, which I was opposed to at the beginning. I have rethought most of my positions on what I would do with an old house since actually living in an old house! My new motto is “do what you gotta do to make it work”! I took out all of the windows in our 1920 Craftsman house this summer, repaired, reglazed, stripped years of old paint off and reinstalled. They were 4 over 1 windows with the exception of the 2 front windows which were stained leaded glass. Each window took me approximately 3 days to complete. I would not do it again. While they look nice, they are definitely not energy efficient, the repair process brought me to tears, as I was not prepared for the amount of wood rot under the layers of paint. I would anticipate that this may have to be redone in a few years. Replace. 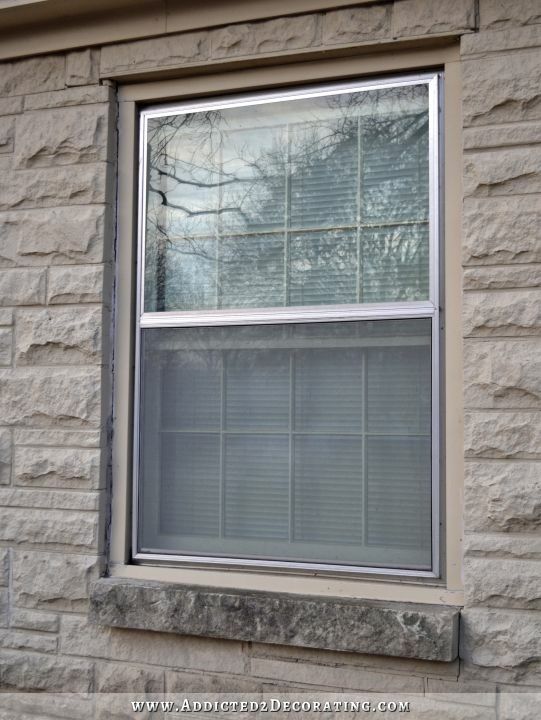 We have old weighted windows, and they look great–but we have to cover them with plastic every winter because it is cold in Minnesota! We added a couple of new windows in our kitchen remodel and kept the same look with the six paned glass and we love them!!! ( For all the reasons everyone else said. ) You have saved thousands by doing your own work on the kitchen….this could be your splurge:) go for it! May I suggest Renewal by Andersen. Not only are Andersen windows the best you can buy, but I heard on the radio yesterday they are offering a heck-of-a-deal right now. Replace them. I refinished wooden windows with stained glass (pre World War II) and replaced all others. The refinishing process–including precautions for the lead paint that was present–was extensive and a real pain. It is also a very finicky process to get these windows to be non-drafty. REPLACE! Not everything old is of value. No guilt whatsoever. I have a house built I 1954 and the FIRST thing I did was replace all the windows and I had a ton of them because I have 2 to 3 windows in every bedroom (4 but they are tiny rooms). Also had a huge bay put in the living room instead of the 3 windows across that was originally there. The difference they make in the heating/cooling of the house in phenomenal. Change them out Kristi. Kristi, I have new vinyl double-paned windows in a 30 year old house, and they are not only energy efficient, they provide a remarkable level of sound dampening. I am never bothered by traffic noises, sirens, barking dogs, or noisy neighbors. And extremely easy to keep clean. My only caution is to be vigilant during the installation to make sure the installers know what they’re doing…my brother had to have some redone. Good luck! Been there, done that, one word REPLACE! New windows much more energy efficient and you can get good looking windows as well. Check to see if your state or community has an energy rebate program, you could end up getting money back. You’ve done your research . . . you’ve thought it through . . . now REPLACE the windows, and don’t look back! Texaswindowinitiative.com. Maybe your area is covered for a rebate. Look into the HVAC too! Kristy, my house was built at some point before 1865. I didn’t have to struggle with making the decision about the windows because someone else before me did. When it was finally done, they chose wooden double sash replacements with white vinyl screens in all but two rooms. When those two rooms were done they chose white vinyl replacement windows. From the outside they look fine, almost all the same. All of my trim is painted white. That makes the windows almost invisible. They are all very breeze free and the rooms are warm. There is one Victorian window (clear glass in the center with square colored panes around the clear glass) in my back porch, which is open to the kitchen that has no storm behind it and it frosts up from the moisture in the house. Consequently, now I have to run a dehumidifier out there all winter. I restored that Victorian window as nod to the past. There is also one closet window that still has the original single pane window (doesn’t open) and it has the original wooden screen for some strange reason. The room with that closet is freezing cold in winter!! I have to get two non opening storms for both of those made and I can’t wait until that happens. On the open prairie in the middle of the country, heating and cooling efficiency come long before esthetics no matter how old a home is. I’d replace your current windows with new double pane, double sash, wood windows that have a look reminiscent of your current windows and call it a day! I would agree with replacing them. If the original existing frames are in salvageable shape, you can do insert replacements. It will allow you to leave the trim on the interior and the trim on the exterior. The new window unit will be sized to fit within the existing frame. You’ll lose a little bit of glass from what you have now, but it’s a much easier less intrusive process. In terms of type of window I’d suggest using a window that is fiberglass on the exterior and wood on the interior or if you can afford it, aluminum clad on the exterior and wood on the interior. Stay away from vinyl at all costs, they typically fail at around the 7 year mark, and have terrible issues with expansion and contraction. Look into Kolbe and Kolbe, Marvin Integrity, Weathershield to name a few. Up here in New England, we wouldn’t even be having this discussion. 🙂 Restoring old windows are a no-go when you need to heavily heat your home for a good chunk of the year and many of us are doing so with oil heat (which was incredibly expensive until this recent downturn in oil prices). Even if you watch restoration shows like This Old House, which films mostly in Massachusetts, you’ll notice that they nearly *always* replace windows…even architectural ones. They’ll typically use custom-ordered reproductions that give you the look and feel of the originals but are way more efficient with double-pane glass and whatnot. I think you’d be smart to replace yours and, if your budget supports it, you can even make them look better than the originals. Also, your brand-new HVAC system won’t have to work so hard (and cost so much to run). I hear you! I grew up in the snow belt, and no one would ever presume that a window’s history trumped the ability to keep a blizzard out. Kristi, get your new windows, and don’t look back. My home was built in 1987 so its only 27 years old but it had wood windows in it – they were leaking and had moisture between the panes. I called around to find out about getting them repaired and the cost was as much as putting new vinyl windows in. This isn’t my forever home so it didn’t hurt my feelings one bit watching them take them out and replace them with windows that worked better and I could actually see out of. I’ll never have to climb a ladder again to sand and paint them either. Our house has 27 windows in it and the new tilt in windows are so much easier to clean from inside the house – even downstairs. I thank myself ever single year I do it and I never had any regrets. Replace the windows and get one more thing off your mind. My wood windows need so much work that I have decided to replace them with Energy Star rated windows. There are rebates and tax credits available for replacement windows installed from 2009 to 2014, so hopefully this program will be extened and I can take advantage of it too later this year!. Get new windows and don’t look back. We finally got around to replacing the old steel frame windows in our 1940’s house. We should have done it years ago. They were top of the line in their day but in the end were good only for keeping out the rain. The curtains moved with every breeze. Do shop around for the best look and the best quality you can afford. It may seem like a DIY project but be kind to yourself and hire it out. Save your energy and talents for your wonderful design work. This is just what I was going to say! My folks are dealing with windows similar to yours since they moved into my grandparents’ 1960s house. The noise of those wood frames and springs makes me cringe just thinking of it. They’re replacing them as they can afford it. One side-effect to changing them…. You can use the old sashes for lots of fun craft projects. I’ve seen people use them as picture frames (one 4×6 or 5×7 tucked behind each pane and then hung on the wall). I’ve also seen a neat use where someone did reverse glass painting (or even front-of-glass painting) in each of the panes so that when the whole window was viewed, the picture looked like it was a view through the window at something in the distance or a bird or pot of flowers sitting on the outside ledge. You can then hang it from the ceiling a few inches in front of a real window and you get a nice back-light effect. Old sashes can also be used to make mini greenhouses (called cold frames), though I don’t imagine you really need that in Texas most of the year. I actually need one here but haven’t run across a free source of old sashes. Replace the old windows but reuse them! I can just imagine a beautiful greenhouse you could design and build in your back yard! I live in a condominium which recently resided. We were offered the opportunity to replace our windows, patio sliders and doors at the same time, and I decided to go ahead. I’m so glad I went for it–the reduction in my heating and cooling bills has been wonderful, as has the end of the odd draftiness in a few rooms. Unless your windows are very tight, and you can put in significantly more insulation while working on them, I’d vote for replacement. Knowing you, however, I’m sure you’ll find wonderful, creative uses for the old windows; how do you feel about cold frames in Texas? We just renovated our second floor. Before that started, we replaced every window in the house. I hated to get rid of the old windows but I cannot believe the difference in the warmth of our house. We used to put the temp up to 68 or 70 and I was still cold. We now keep it at 62-64 and sometimes I am still too hot. I love the windows and they will pay for themselves in no time at all. It looks like you really have to replace them. You could keep the old ones and make a greenhouse/outdoor sunroom out of them or sell them on Craigslist. You could also use some of the old windows as a design element in your house somewhere if you wanted. Not all old wood windows are good windows. We bought wood double paned windows for our house 30 years ago. They warped, leaked and the seals broke. About 10 years ago we got Marvin wood windows that are excellent! We did a few at a time and it was so worth paying for the quality. They are like new. Installation is important so using a qualified dealer is important. Ours came unfinished and we stained them ourselves. They also come primed for paint. You still get to do some DIY in there. They are so quiet, tilt for cleaning and keep the house warm while looking beautiful. 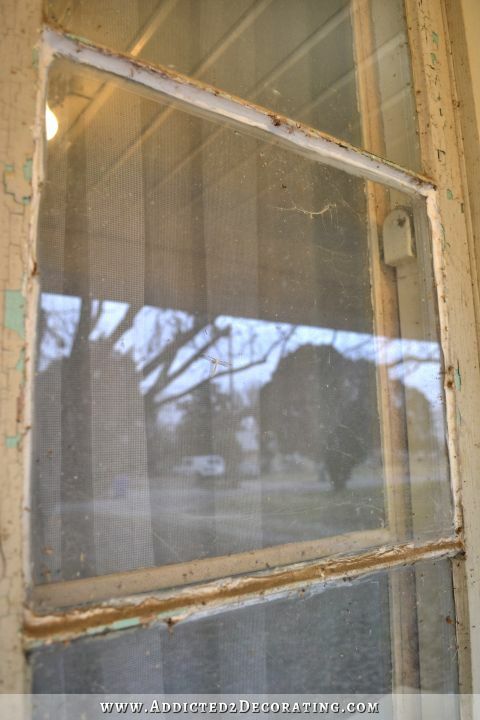 The amount of work involved in just making them usable again will be overwhelming and then you’ll have to come up with some kind of storm window so they can be used. A big time user and money eater. You’ll probably be better off getting new vinyl windows as they are more efficient, don’t need painting, are easier to keep clean and you will have the screens/storms built in. Seems like a no-brainer BUT if you want that ‘original’ look, then look for companies who specialize in wood window repair. Every time I see old wood windows I just cringe at the thought of the inefficiencies. Since you are going to remodel the whole house, and not especially restore it, I’d say go with new windows. No guilt! Replace. I live in a place with long, cold winters and hot summers in a 1930’s house that had a mix of original and crappy replacement windows. The original windows did have weights and pulleys but also layers of paint that made them hard to impossible to operate and big, heavy storm windows that needed to be put on/taken off every year, and no screens. I replaced all the windows with all wood double-paned, true divided light, farmhouse-style windows. Because they were paint-grade, pre-primed they were less expensive than if I had stain-grade wood, though they were still pricey. But…they are well-insulated (no need for storm windows), tilt out for easy cleaning, and have integrated screens. Because they are wood frames, I can re-paint them if I decide to change my color scheme when I repaint the house. It hurt to spend all that money at the time and now, years, later, that financial pain has faded and I still am glad I have my nice windows. My mom just replaced all 30 windows in her 45 year old house. She went the all vinyl route with dividers between the glass panes. They look great and you can tell they insulate so much better. I forgot to say that my mother’s window have light-colored screens that are of a thinner stretchier material than mine have. You can’t even tell there are screens there unless you go up close. I do wish this had been an option when I bought mine 22 years ago because the screens do cut out some much-needed light. 2. Strip, reglaze, restain. Repeat all at regular intervals. Somehow, I think you could better spend your time on other projects. Find a better window company- triple pane Low E and sturdy frames. With the expert installers. Like your future HVAC project, you will get a better ROI. We had to replace our HVAC here 6 months after move-in. Previous system was improperly installed for efficiency, so things had to change. You and I share a climate zone. Eeeek the price. but the low bills are nicer. This house has all aluminum windows with storm windows only on the northern windows. I’ll be watching what windows you choose and why, I see windows in our distant future too. So many responses and it’s overwhelming, replace them. After buying our 1949 Seattle area home, I was all about keeping it original. My husband is actually a commercial glazier and is the “expert” in that area. After much agonizing, on my part, I agreed that for the sake of efficiency alone, it would be worth it. All the windows in the home were double strength with no storm windows. Anytime I would cook or boil water all the windows would steam up…..not just in the kitchen. We worked with Home Depot, on a budget, and started replacing bedroom, dining room, and family room windows. We have a view home, looking at Mt. Rainier, so these window are HUGE! We still have the living room windows to do but my husband is going to make them himself….with openers. Our heating bill has dropped and only the old windows still fog up. The value we have added to this home has been worth the new windows. Replace! It looks like you have the same siding I have that covers the concrete of my basement to where it meets our Hardy Plank siding. May I suggest you caulk the grout lines – it makes the fake stone look more authentic. I did that last summer and am quite pleased with the look. There are special grout looking caulks available. I found it to be a bit messy and it took a while to get the feel of it. A handy wet sponge and a bucket of water for smoothing helped. I’m sure an incredibly talented person like yourself would do a beautiful job. I love reading your blog! Thanks! I don’t have fake stone. I have real Austin stone that has been painted. 🙁 I’m hoping to strip it off somehow. I’m with everyone else. Replace.You’re not restoring the house, you are updating so there would no value to restore the windows. Less frustrating and you probably would spend as much as replacing. You could have all the windows match and could even turn the door to your office from the porch into a window, It will be more efficient and they are easier to keep clean. Since this is your forever house easier will be better down the road. Do you have a Mr. Rodger’s windows. They run specials. Check them out. Mine were from a local manufacturer. See if there is one in the area. Don’t kill your self over windows. You have more important things to do. keep the old windows for a greenhouse or other crafts. My last home, built in 1934, had wonderful craftsman style windows with thick wood jambs and casings and true divided lights. They also had the rope and weight system. Because they were so drafty we had the glass replaced by a company called Bi-Glass, which we had seen on This Old House. They are still around but I don;t know if they have a franchise in Texas. They keep the frames and replace the glass with double layer glass. Because this is Connecticut and the winters are brutal, we also went ahead a replaced the aluminum storms with new ones in white. The white looked SO much better than the metal. In fact, they were very hard to detect from the outside. In my “new” old house, built in 1924, the previous owners had the windows replaced about 15 years ago with vinyl. Most of them have held up well, but some have warped (I think from the sun), don’t close all the way, and don’t latch either. They also don’t seem as well-built as windows that can be purchased today. Maybe the technology has improved over the last 15 years. This is why I covered them all with window insulation film this year. I don’t know the brand of them, but if I were to replace them I would definitely go with a national brand with a lifetime warranty like Andersen or Marvin. I have heard all kinds of stories about lifetime guarantees from lesser known window companies and manufacturers, but when the guarantee needs to be filled the company or manufacturer is no longer in business. On the plus side they are extremely easy to clean since the top and bottom sashes tilt in. Replace – and no guilt required. Hope you can partner with a sponsor and get it done sooner rather than later. When we did it, I know it sounds hokey, but our quality of life literally rose…less noise pollution, less dust/dirt pollution, less weather in general. Go for it! Have fun choosing new windows! Throw away your guilt along with the old windows! Even though the initial cost is a lot, you’ll reap the rewards in the years to come. When we built our home 20 years ago, we changed from double hung windows to casement windows by Anderson. They have the screens on the inside of the window (this seemed a little strange to me), but over the years I have come to love them. In the winter, I remove the screens so the windows look brighter and return the screens to the windows that open in the spring. this has “lightened” up our rooms a lot. Our previous home had Pella double hung windows with the rope and weight system you mentioned (these were in the home when we bought it). At about 20 years of age, the ropes began to break as they started to rot from the sun. So we kept replacing the working mechanisms……a hassle! Technology has probably improved the materials for the “rope” system. I love the idea of reusing some of your old windows to create a garden shed or selling them to others. Replace without guilt – what you will save in energy costs will more than make up for any “guilt” – your new HVAC system will run more efficiently, and you can choose new windows that look every bit as nice (if not nicer) than your original windows. Call a realtor, sell the condo……..buy new windows. EASY PEASY 🙂 Now, Kristi…get er done! Replace them! Make your life easier – they’ll be easier to clean, you’ll be more efficient Save high maintenance and trouble for something more rewarding. Replace them and don’t look back. If they were the craftsman-styje, I’d say keep them but they’re not. Put in new quality good ones. I honestly believe that would be the better option. Having dealt with an older home (1860 Mansard Roof) in Boston, I would recommend replacing. Stripping paint, especially lead paint is just not worth it. More then likely the ropes holding the sash weights are all rotten which is another reason why your windows aren’t working. I replaced the windows in the first floor with custom made wood sashes, the second and third floors already had replacement windows in. 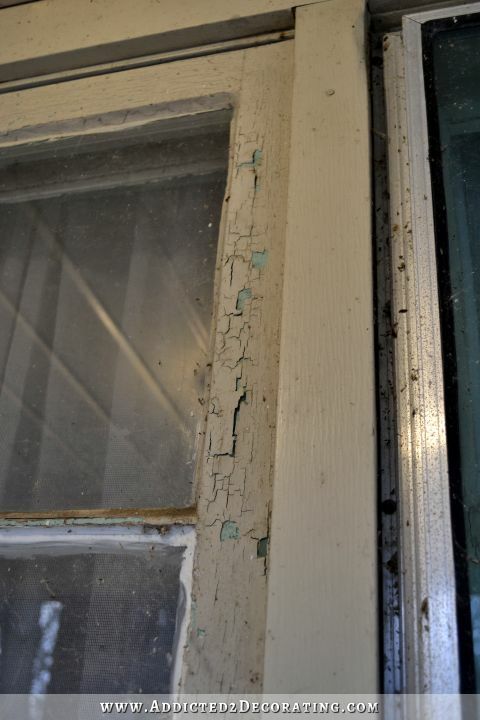 The other issue with old windows is weatherization. The newer windows will make your home much more energy efficient for both winter and summer. In the long run they will be worth the investment. This is one of those questions That I don’t think there’s an easy answer other than do your research. If you do get replacement windows, try to make sure that it’s a brand/design that will last since you intend for this to be your ‘forever home’. And yes, he is mainly talking about the older, truly historic kind, but if you read the comments he does address resources to save newer ones. Maybe it might be worth exchanging a few notes with him to see what his thoughts are on windows in the condition yours are in. The home I grew up in was of the same vintage as yours. The windows (at least then) were in much better shape and I couldn’t have imagined trading them for anything like my much newer townhouse had. Those vinyl windows which were closing in on 20 years old when I moved and were in sad shape. Any that were used regularly had one piece of hardware or more that was broken and parts, forget it, no one could find them. A few of the windows that got a lot of sun were on my list of things that really needed replacing. The pocket of air that makes them energy efficient had given up the ghost which you could tell by the dead bugs between the panes of glass! I hope things have improved since those vinyl windows were made but they definitely soured me on those types of windows. It really doesn’t seem like those were made to last more than a decade or two. That’s why if I were looking at full scale replacement in a home I intended to stay in, I’d make sure I found a choice in windows that I expected to out-last me! Good luck in your research! I feel your pain. I had a 1928 Tudor style home that I absolutely loved. Except for the windows. I too felt guilty about getting rid of the old windows. I did love the glass! But they didn’t open, posing a fire hazard for our young child (well, us too I suppose). There were no screens. Terribly inefficient. So we replaced them. All 26 of them. And it was scary. But so worth it to have triple pane windows that opened & closed! We got our windows from Woodbridge if you want to check them out. And yes, they did test positive for lead! Replace. You and your cooling bills will appreciate it. We live in a 1980’s construction frame house. The double glasses windows are Anderson. Stained wood on the inside and vinyl clad on the outside. They all look and seal like new. Recycle the windows. Give them away on craigslist or to a Restore. Look on pinterest for inspiration to include them in some decor/crafty way around your house (not that you need ideas). I’ve seen old windows used in sheds (where insulation isn’t a high concern), in clubhouses, in making small greenhouses or big ones, in making windowed doors and hung on walls as decor. The possibilities are endless. You could craft with yours, or give them to someone who could find new life for them. Energy efficient windows will match for you, save you money in heating/cooling costs, AND help the earth. Brownie points if your old windows (who have served for a long time) get upcycled for even longer use. I’m sure you’ll make the best decision for your life and your home. I so look forward to seeing your house get a facelift whichever way you go. I run a window restoration business in Philadelphia and I thought I could provide some insight here. The thing I always tell anyone I speak with is do not replace your old windows because you believe it will save you money in the long run on energy bills. Apples to apples it just is not a wise financial decision unless you have plans to super-insulate your home. Even an article by Consumer Reports from the summer of 2014 asserted this same view. The major caveat, as is mentioned in this post, is that you must have a storm window installed to make it an apples to apples comparison. Two panes of glass are valued the same as far as energy efficiency is concerned, whether they are located in a new window with double panes or an existing single pane window with a storm window. The argon gas in new windows does help but its value is minuscule. So as far as I am concerned, as long as you aren’t telling yourself that you will be saving money by replacing your windows, I find most all other reasons acceptable. Ultimately, I feel the decision is a personal and aesthetic choice. So as Kristi mentions here, she doesn’t like the look of storm windows. That is reason enough to me. If you like the tilt in function of new windows, great, go for it. The problem is once you realize that the choice to replace is purely a personal or aesthetic choice, it becomes much harder to justify the cost of replacing. There are a few reasons to consider restoring your existing windows. I generally view the cutoff at WWII as Kristi mentions in this post. The wood and materials used before WWII is noticeably better than those used following the war. What does that mean? It means that they can take a beating. Neglecting maintenance for 15 years is nothing for those windows whereas post WWII windows are far less resilient and fail quickly (15 years is the common lifespan of a vinyl window by the way). So for all intents and purposes, a pre-WWII window can last forever. The large majority of windows that we work on are 100 years old or older and they are still standing. Do you think a new window will get even close to that? This is not to say that there aren’t windows from the post-war period worth saving. The windows from the 1950’s were still fairly high quality just not as resilient. Do not forget that those old windows were built to be perpetually repairable. The parts and materials to fix and maintain them will always be readily available. New windows have parts that may be difficult to source. Another consideration is that a new window will never match the style of your home like your existing windows do. Finally, there are companies like mine that can restore your windows for you but it is also a very DIY-friendly task. All you need is patience and take it one window at a time. Whatever you choose, don’t forget that it is your house and it is your choice. I hope this helped. I grew up in a home built in 1901. The windows are rope and pulley and my parents were encouraged to never replace them and they haven’t! The ropes on a few windows have been repaired over time and they’ve lived there since 1972 – they are fantastic windows. Renewal by Anderson. Hands down, great experience. I would do an ad for them. They replace just the windows so in & out in 3 hours. Improved our heat loss cold loss & keeps out the UV rays. Maybe they would comp you for your blog. You will not be sorry! This post could not have come at a better time for me. I need all new windows in my house too as they are in much the same state, although not quiet as bad, as yours. Wood windows installed in the late sixties! Cold, drafty, cloudy…I HATE THEM!! After much renovation, finally ready to start replacing them as my budget allows. Looking forward to your future posts on this topic. I vote, replace your old windows asap!!! Yes, get new windows that are energy efficient so you can save on cooling and heating. We bought Anderson windows over a period of about eight years so we could begin to afford having them on the whole house. They are wood on the inside, vinyl on the outside, and have an argon gas filling between the panes. The west windows have a bronze coating that reduces heat gain and prevents some sun fading. We began with our basement windows since those were in the worst shape and now we have all fifteen windows replaced. We did the work ourselves in our brick house. After almost 20 years living in our home with drafty aluminum windows, we finally had the money to replace them a couple of years ago. It is not a decision I’ve regretted once. Since the wood windows don’t have any historical value and would require so much work, I wouldn’t hesitate in replacing them. You will save so much in energy costs plus making your home feel so much better. You can always re-purpose those wood windows. I’ve seen them used in so many ways such as artwork frames, chalkboards, and even to make greenhouses. I’m sure you could come up with something or you could sell or give them away. I think you’d be happier replacing them but good luck with whatever you decide! I would replace in a heartbeat. you can always re-use windows for other things. Being a gardener, when we replaced our windows, I am going to use them and built a greenhouse and the extras, if there are any, will be used for garden cold frames. There’s always something you can do without sending them to the landfill. I grew up and lived with the rope & weight windows until I built my house and have energy efficient vinyl windows (double pane) that tilt out to clean. Never going back by choice! Replace them and reuse them elsewhere! Post WWII houses had to be built really quickly to meet the housing demand. Most materials were of good quality, except the windows. The very best thing to do is replacement windows, even if it’s only one room at a time. I would choose windows with wood interior and vinyl exterior. Of course, if I were rich, and could also afford the constant upkeep, I would choose new solid wood windows. The exterior upkeep is quite expensive and labor intensive, especially in the sunny climes. I buy lots of old wood windows to use in making hanging shelves, etc., but even then you have to take great care in any sanding before repainting with a lead free paint. One of the first comments here started with ” knowing the age of your home . . . .” hmmmm, have you ever told us the age of your home? I was thinking back to house I grew up in, trying to remember what the windows were like – it was over a hundred years old waaaaay back in the 70s (I believe). I can’t remember, and my parents did some extensive remodeling when I was in grade school, so a LOT of those windows WERE replaced with aluminum windows. On the OTHER hand, the house I live in NOW is only 19 years old, and the windows work like cr*p, but that’s probably because they were installed sloppily. It was built during the housing boom (especially in this part of the country). Good Luck in whatever you decide to do. I’m in a similar boat with my 55 yr old home and our old wood window situation. Looking into it, I agree with what Adam Butler had to say on the cost factor of replacing them, it would take years to recoup the costs with the energy savings. Vinyl windows don’t last as long as wood with the expanding and contracting, and new wood windows can be more expensive. I decided to just restore our old wood windows, that said my storm windows are in good shape, and my wood windows were only stained, so no lead paint to deal with. They really just need to be refinished (painted or re stained) and new glazing done. One other reason I decided to keep them and restore them vs replacing them is because we live in a high radon area, having the windows keep the house “air tight” probably wouldn’t be a good idea for health reasons. I’d replace them. Its not like you have a real old historic house that you are refurbishing back to ‘the day’. And energy efficiency is a must! Do it! Replace them for energy and ease of care, You have enough on your plate the way it is. If someone else squabbles about the ‘old house restoration’ thing – let them come over and fix all those damned windows! I’ve got the old, weighted windows and I love them. LOVE THEM. I live in California and I love that when we have an earthquake I can hear the weights banging around in the walls. I even love the very small draft that comes from between the upper and lower windows when it’s windy outside. I figure it keeps fresh air moving throughout my home. I love to think about how old they are and the different people who have opened and closed them. I love the slightly warbly glass panes. I’ve repaired them myself many times – it’s always been easy to do. My house was built in 1932. I don’t even have screens. I would hate to cover my windows. That being said – get new windows! Your windows aren’t these romantic windows. You live in Texas with extreme weather: cold, heat, wind, driving rain, ice, hail. It doesn’t make any sense for you to do anything else and you, Kristi, are sensible. One thing I keep reading and it’s making me a little nuts – is about the energy efficiency of these new windows and how they are better for the environment. They are energy efficient AFTER they are installed – the amount of energy required to manufacture them outweighs any energy saving realized during the life of the window. And then you get to factor in the old windows going to landfill or wherever. What happens to that lead paint – right? I got this from an aluminum window salesman who worked on my mother’s home (in Texas!). He admitted he enjoyed hearing this rationalization to buy his windows, but would never use it himself because he knew it wasn’t true. Whatever – get the windows because it’s the right decision for YOU and your home. On the part of the double-hung facing inside, fit an Indow window that can be left permanently. On the top part, get pre-made simple storm windows that are screwed to the outside and edged with clear silicone caulk, if needed. Screens over these to hide all from the street, and this approach leaves the part of the windows that rub together free to move. All cost a bit more money than I have right at the m,oment, but FAR cheaper than brand new windows, including (UGH!!!) vinyl. It took most of 30+ years living in our 100 year old house to finally make the decision to replace our windows. It’s so hard to let go of that old wavy glass. This may be common knowledge but was new to me…very old window glass is thicker at the bottom than the top. Gravity actually causes it to ‘sag’ over the years. This was visible on ours. Fortunately my daughter has plans to reuse the old windows in custom funiture projects in her own 100 year old home. So they will be saved! All that being said, I’ve not regretted it. The functionality of the new windows is wonderful. On another note, I now know that the pretty wall dividing my living room and dining room is called a pony wall! I’m amazed at the wall you built! Your moldings/trim look like an exact replica of ours. You really know your stuff! Thanks for all the knowledge that you share. Kristi, with the number of replies you have gotten, you’re probably not even going to see mine. But my vote is absolutely save them. It’s a fallacy perpetuated by today’s window manufacturers that their windows are better and more energy efficient. The National Trust has disproved this and published briefs on it. Vinyl windows have to be replaced every 10-20 years, they are that worthless. Your house will never look the same without its original “eyes”; replacement windows ruin the look of an historic or vintage house. Before you make a final decision, discuss it in the forum at wavyglass.org. You will get great info and help there. There is another website that covers making the decision as well, but I can’t remember the name of it. It’s run by a man named John, and the folks at wavyglass will know the name. Lead paint is much less of an issue as we’ve been led to think. Since you have no children in the house, it’ll be a minimal problem. Restore ONE window. Just one. then you’ll be able to make a completely informed decision. I had the wood and weights style windows replaced in my over 100 year old home with Marvin double hung and am so unhappy and disappointed with them. Still drafts and whistles in windy weather and I can hear every thing outside. My old single panes and storm windows were much quieter and more efficient. Live and learn. It’s probably not the window but the installer. If they don’t know what they are doing new windows won’t work the way they are supposed to. In terms of energy efficiency as well as time and monetary efficiency, it’s a no brainier: replace. Especially if lead paint might be an issue. Replace without a second thought. But I would be careful in working with the old ones due to the strong possibility of lead paint. Making your house your own applies to all parts of the reno. For me, that means easily opened and closed windows with wonderful screens and no drafts! Replace them with something you’ll love! Yeah, those windows aren’t worth saving. Those windows with the springs are awful. You shouldn’t feel guilty. Our windows are 125 years old so have the ropes and weights. I gave in and went for new windows upstairs only because I can clean them easily from inside because the glass rotates on them. But downstairs we (and by we I mean my husband) routed out the space where the glass goes so that it was deeper and bought double pane glass to replace the top and bottom sections of glass. The windows don’t have all those little panes, that would have been impossible, just a top piece and button piece of glass. in reading through these replies and your concerns of lead paint, I would probably have them removed and thrown out. If you sell them someone with small children might buy them and that would be disastrous. And making a greenhouse out of them might not be any better either; you could end up with the chips of paint falling off & you would then track into the house. I think somebody mentioned that this also might not be good for Matt so that’s a consideration. Walk away from those old windows! You will love the energy savings, noise reduction and ease of use that new windows give you. We replaced all of our windows last year and I couldn’t be happier. Ours came with 1/2 screens so we can open the house up when it’s nice, keep that in mind when researching for the right window for you. Good luck! It looks like you’ve got enough votes to help you decide to ditch those wood windows! I’d like to read that article you mentioned about post-WW2 windows; I had no idea there was a difference. You’ve got enough to do- ditch those windows and move on! Replace those suckers!! you do not want to mess with lead paint(proper disposal is expensive and the process is time consuming). Donate the old ones to the restore so that someone like me can turn them into useful home décor. We recently replaced our post-WWII wood double pane windows and aluminium storms with vinyl this past fall. I’m QUITE happy with the change. The look from both inside and outside the home is so much cleaner and less cluttered. I love love LOVE not having the storms. I will say, going from double pane with a storm window to double pane without has increased the noise level a slight amount. I wish we had gone with triple pane windows just for the noise factor. And triple panes might be a must for you with the Texas heat extremes. In Indiana the extremes are so, well, extreme 🙂 and double pane are the standard. Also, we went with Pella windows, purchased from an independent Pella dealer and are quite happy with both the windows and the experience. The do have different wood offerings as well and a fiberglass offering that has the look of painted wood. Our house was built in 1925 and we have a lot of things in common with your house. Our kitchen cabinets look identical to your original ones (we are replacing them when we do a total gut on the kitchen), the wood floors are the same and even the teal/green paint on the wooden windows! Our teal/green is covered in yellow but it’s been a pain to strip them down. I love our wooden windows and can’t bear the thought of replacing them but we are fortunate enough that it’s just some of the glass panes that need replaced. Maybe look at a Habitat for Humanity Restore (we’ve gotten a lot of things from there for our house) or craigslist to see if you can get replacement ones that match. But if you can’t restore or save them, don’t feel guilty about replacing them! What type of replacement are you thinking of doing? The pop out-pop in type of replacement keeping your frames? If so you know you will be loosing a good bit of glass area from each window. Also, I have been told by someone who does this that it is really easy to do. If you are thinking complete replacement that is something else. I think with the outside redo you are thinking of doing new windows would really i nance the look of the outside of the house. If you keep your old frames they will most likely need to be refinished anyway. Kristi, I didn’t read the comments so someone may have mentioned this, but there are companies out there who make energy efficient, true divided light windows. They aren’t cheap though. I personally don’t like vinyl windows…love the true divided light. That’s one of the reasons I dread downsizing and moving to a smaller house one day, I know it will be hard to find a home with the true divided light windows since everyone is replacing the old ones. I just hope the companies that are making them right now don’t stop because when I do downsize one day, if the home I move to has vinyl windows, I will want to replace them all (a few at the time as I can afford it) with the custom made, true divided light, double sash windows. So that’s my 2 cents…probably not the popular answer, though…and definitely not the most cost effective one. Replace them!!! You won’t believe the difference!!! New double paned double-hung vinyl is the way to go!!! The top and bottom of the windows tilt to make cleaning a snap! Outside noise is muffled by the double panes and you can touch the inside of the window getting direct sunlight on a July afternoon and it will be cool!!! You will wonder why you ever hesitated, I promise! We had these same windows in our Jackson, MS home and my parents-in-law Arkansas home. We ordered our windows from this site http://www.windowestore.com/ installed them ourselves (so much cheaper). We ordered the new windows and cutoff the flange to install; this is because we didn’t want to replace the siding. We had wood hardiboard siding and the flange that comes on replacement windows makes it difficult to fix the siding but wider window trim would have worked. My husband says a novice should order the replacement windows because he had to be really careful on nailing the window through the frame. However, I would evaluate the depth of the both type of windows (replacement/new) to make sure how they sit in the frame. This also impacted our decision to purchase new install type windows. Our house was older and couldn’t handle replacement due to the depth of the window. I wouldn’t normally write all this, but your so handy and detailed, I think you can figure this out in your research and the details won’t overwhelm you; it will give you more information to make a good decision. We liked the website and used them twice, over the course of four years, to order our windows specific to a size. Our windows were older and so they weren’t standard sizes found in the bigbox stores; so the website worked great and they sell the pella and Anderson windows. We also received free shipping for each set of houses, as we had ordered a number of windows which met the price point for free shipping. So, for our Arkansas home, we ordered one that was 7 feet long and a picture window (the views are great) and it cost $600.00. That’s a lot of window for the price; it’s argon filled and has glare protection colorant (very light beige) because we have full sun on that side of the house. Replace them! We recently replaced our windows, wood inside that we had stained to match all the other woodwork in the home and fiberglass outside. They’re wonderful and beautiful and should last us 40-50 years! You should not feel obligated to keep the windows! I’ve seen many properties with old wood windows which no longer do the job. Repairing would cost too much in your case, so replacing them is really the best decision. I felt the same way you did about replacing the original Windows on our house. It is an 1860’s victorian house. I wanted to keep everything as original as possible – however we live in upstate New York where the winters can be brutal and the summers hot. I got tired of shoving batting in the gaps in the winter and fighting to get the Windows up in the summer ( not to mention the cold and high heating bills. We started by buying 3 replacement Windows and loved them so much that we kept buying 3 at a time until most of the Windows have been replaced – (19 so far). We have not yet replaced a 95 in Windows in our living room or the bay window in the dining room – but hopefully soon! We cannot believe the difference and it is a pleasure not to struggle to raise the Windows in the summer and using wood sticks to hold the old Windows up. We copied the configuration on the original Windows: 2 over 2. We haven’t regretted our choice! me a long time though. The vinyl windows are all terrible (15 years old) and all will have to be replaced. The wooden ones are way better now than the vinyl ones I live in Canada (-25 to -30 Celsius) where I live. You must have way different pricing down there for certain well known window manufacturers starting with an “A” because the quote I got for ONE window (37×66″) was $3400 plus tax (composite outside, wood inside). I think that once you get rid of the wooden windows you are doomed to continually buy new windows every 20 years – which is pretty well the life of the seal in double glazed windows and coincidently the warranty length on new windows. Have you watched any videos on Youtube about how to repair old wooden windows, because that may help you to make your decision? I, too, have old wooden windows which are difficult to open and close properly. After watching This Old House demos on Youtube, I found that my problem isn’t anywhere near as expensive as replacing every window in the house. It’s just that I need new “Sash Spring Balancers”. I tho’t perhaps I had rope & weights in my windows, but I don’t…. I have spring balancers with broken cords. New balancers will cost me less than $30 a window, and an hour’s work for each window, but for someone like me who really can’t afford all new windows, that seems like the way to go…. & I can keep the wood windows I like. My suggestion is, if it’s a cost problem, check out some of the videos on Youtube before making your final decision. It’s easy for some to say, “Just replace the windows”, but as a single woman living on a fixed income, it’s not easy for me to do that. My windows are good and solid…. the house is 40 years old, so not too ancient….. and I already have good storm windows, so for me, the cost effective way to go is to just to get new spring balancers. If you don’t have the type of window with weights, I will bet that is all you need, too. Check out some videos before you make your final decision. I know I can do the work myself and I’m a lot older than you are!